This house is stacked to the gunnels with National Geographic Magazines. So many, in fact, that I must confess that not all have been read, though the unfailingly gorgeous photo essays have all been perused. 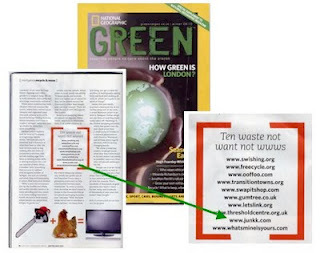 So imagine my (happy) surprise to be leafing through a 'green' special, and find that Junkk.com has been listed in a top 10 'waste not' collation of sites. Mainly for our efforts in the area covered by JunkkYard, which is not as great as we'd hope(d), but another welcome bit of recognition and endorsement nonetheless.